Dimensions (W x L x H) m.
Door size (H x W) m.
UV resistant Polyethylene is in 300 gr. quality pr. 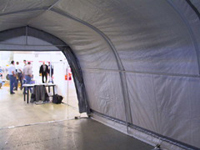 m2, the tarpaulin has a high tensile strength and has a woven core which makes it almost impossible to tear. 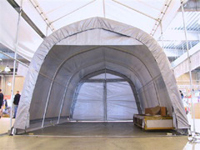 If the tarpaulin is cut or damaged, the Rip Stop will prevent the hole from getting bigger. The tarpaulin is made up of 3 layers with an outer coating to prevent dirt build up and easy cleaning. The frame is a locked construction to achieve overall maximum strength in the building. Includes heavy steel profile bottom frame with flat irons that lock the frame into postion when assembled. The shelter is secured with heavy dirt anchors that have a pull out weight of 400 kgs. and includes heavy stake pegs. It can also be bolted to other surfaces such as concrete or a wooden frame.